"Australasian Aquaculture 2004 will be the first in a series of national aquafarming conferences to be held biennially near the major aquafarming & aquaculture producing areas of Australia. 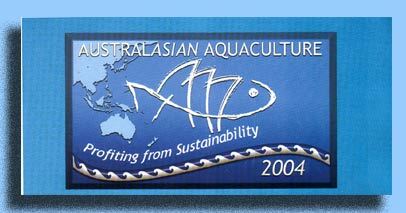 Australasian Aquaculture 2004 will be the biggest aquafarming conference and trade show in Australia since World Aquaculture '99. This international conference and trade show will examine the Australian National Aquaculture Action Agenda and also provide a wider forum for general exchange of technical information among producers, suppliers of equipment and services, researchers and policy makers. Australia is an ideal location for the event because of its close links with New Zealand, the Pacific Islands and Asia". One of the major problems with aquafarming or aquaculture in Australia is the failure to apply the asset of commercial experience and expertise to new projects. Many times over the last 20 years potential aquaculturists came to look at our projects (as you can now read about in aquafarmer.com.au). They would look around and gather information and leave confident they could copy what they needed. In any case, the copy-cat approach to aquafarming never worked. Nor did the approach that "if we throw enough money at it, it must work". Supprisingly, quite a few aquafarms were built and operated on that principal. They are not around today. Silver perch aquafarmers, in particular, still have not grasped just how site specific fish farms can be and how important that fact is to commercial sustainability. Copy-cat farms are as bad as academic text book farms. They are not commercial, they have no longevity, they are costly and they give the industry a bad name when they fail. Aquafarmer.com.au and associates have never developed an aquafarming project without first examining its potential as a commercial pilot scale project covering the period of growout and market analysis. And this proscess takes about a minimum of two years. And during these developments the government research information made available to us for any project has been basically useless. As such I have never put much faith in consultants nor, for that matter, fisheries research. Theirs is a different world of academic sponsors and or unlimited funding with no commercial focus. One disillusioned researcher has told me that NSW Fisheries (now DPI Fisheries) really doesn't want any coastal aquaculture. One must really wonder at such comments from such a highly respected original thinker? In hind site the development of commercial aquafarming in NSW has gone from hope in the early 80's to an investment-less standstill while many millions of dollars are still wasted on shinny unproductive government research facilities. For a current example, look no further than the prawn industry. The apathetic attitude displayed to this industry sector has been nothing short of disgraceful. All Australians should be more than concerned that Australian Government Thinking is destroying a new industry just as they become commercially established. It's taken nearly 20 years of pioneering aquafarming work, (not research), by people such as Frank Roberts only to be made unviable by allowing unsustainably cheap Asian cultured prawns to flood the country. Profiting from Sustainability, I think not. The only good point is the knowledge that such Asian cutlure methods are unsustainable and the Asian industry has to be in danger of sudden collapse. History has shown that the Asian prawn aquafarming method is unsustainable. This type of culture has been socio-economically devastating in the past but by the time it collapses again Australia may have sacrificed its home grown industry. That represents a loss of many many millions of real, primary production dollars, jobs, families and all that should follow on from positive primary production. My point is simple, the aquaculture industry is shackled by people who simply would not survive. These are the same people who hold a position of power and control over industry development. Politically minded control is why we have no investment and no sustainable primary aquafarming industry. The situation is quite obvious as to who is profiting and what is actually being sustained. The recent Australasian Aquaculture Conference was seriously sub-titled "Profiting from Sustainability" which only typifies the commercial problem. It was not so much a con-ference as it was a con. The commercial sector were only obvious by their absence. And those that did attend were heavy with concerns for the future. There is no regulatory stability. This was a 'conference' heavy with the same empty academic rhetoric and overseas trade suppliers of almost 20 years ago, with some notable exceptions such as the McRobert Technology Developments. One summing up quote from the conference was "it is an up-hill battle with continual changing legislation". An old university buddy, who has been highly successful in Tasmanian cage culture, remarked at "what a waste of a life it has been" and "who would go into aquaculture". Excepting that he was now too old to change, his frustration was clear. Both our aquaculture journeys from then until now have been hard. "Seven days a week for two years only to loose the crop just on harvest. And then to have to re-finance and do it all over. Yes, commercial aquafarming has been a hard game". 'Aquafarming is not a good career path, it's not even an average career path' unless of course, you are in the DPI. Commercial aquafarmers must develop their own site specific research and follow that with commercially orientated pilot scale ventures (which can be highly tax deductable). Stay away from USA duplicated so called research that Australian Government has served up. It has absolutely no relationship to local commercial production. Developing and establishing commercially focused associations would provide political leverage. Aquaculture must use the political advantage associations have to apply pressure to achieve stable licensing and fee charges and create the economic stability necessary to attract sustainable investment. That's real profiting from sustainability.